If you think there are no real action flicks around nowadays, this one may help you change your mind. 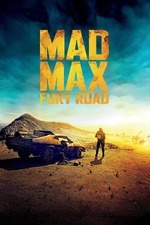 If you know the earlier installments of the series you might realize there are some connections but actually this is a standalone, full-on action movie in the post apocalyptic desert and very much in the same tone like the previous films but with a slightly modernized look (and new actors, of course). Most of the action seems to be made in camera without heavy CGI. The 3D effect I found irritating, as it doesn’t really improve on the experience. The story is kind of unimportant, basically Max is caught up in a chase through the desert and back with a big convoy following and attacking him and the girls. The most interesting parts of the film involve very well choreographed fights while driving. The action is not mindless, every move is justified and everything looks impressive. In between the action, the scenes are ok but this is not the kind of movie for deep drama anyway. Go and enjoy if you are able to ignore some logical flaws.